If you know how important good SEO and content marketing are for your digital marketing strategy, you might be using Searchmetrics. Searchmetrics provides some of the best SEO, content marketing, and social analytics out there. With a Searchmetrics dashboard, you can combine all your SEO, content, and social data (from ALL your different tools) together in one place. Optimizing your site has never been so easy! Create your Searchmetrics dashboard today! This historic widget shows the number of backlinks your site has. Backlinks are defined as links found on other sites that link back to yours. 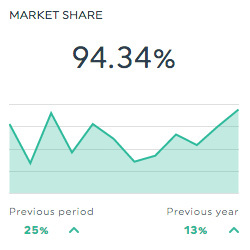 This historic widget shows your site’s market share when compared to your competitors. This historic widget shows the number of domains that your backlinks are originating from. This pie widget shows the number of and the distribution of social links across all your networks. Want to see all our Searchmetrics preset widgets? 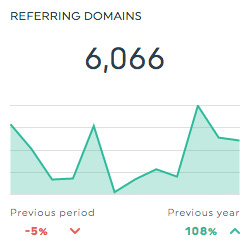 This is the number of Referring Domains. This is the Social Visibility for a given domain or subdomain on leading social networks (Facebook, Twitter, LinkedIn, Google+, Pinterest). Social Visibility includes user actions, such as liking or sharing the domain in the social media space (e.g. via Facebook’s like button). The different user actions are weighted differently depending on the influence of the network. Project SEO Visibility differs from general SEO Visibility in that it uses a project’s selected keywords to evaluate visibility. It is made up of ranking keywords search volumes and positions. Within these figures, each position is ranked individually according to factors determined by Searchmetrics. The nature of a keyword, as either a ranking or navigational keyword, equally influences SEO visibility. 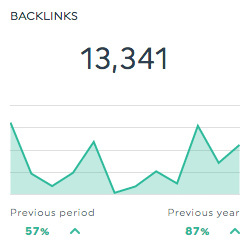 This is the number of Backlinks. This is the Marketshare for the monitored keywords for a domain (either a project or a benchmark domain) in the organic search results in a given country. This refers to the strength of the backlinks pointing to a page using extensive Searchmetrics SEO data. It is similar to Google’s PageRank. This is the number of Social Links for a given domain or subdomain. This is the Average Position in search results. This is the name of the Social Network. This can be related to the referring social network (for traffic sources) or the social network (for social data hub activities). When using manual campaign tracking, this is the value of the utm_term campaign tracking parameter. When using AdWords autotagging or when users use organic search, this contains the keywords used to reach your property. If none of these apply, this value is (not set). Want to see all our Searchmetrics metrics, segments & dimensions? How do I create a Searchmetrics dashboard report?